Come for a visit in Bear Country with this classic First Time Book® from Stan and Jan Berenstain. Brother and Sister love to play sports, so when Mama becomes the official soccer mom, Papa feels a bit left out. Will Papa be able to find a way to cheer on the team, or will he be sitting on the sidelines? This beloved story is a perfect way to teach children about the importance of good sportsmanship and supporting one another. 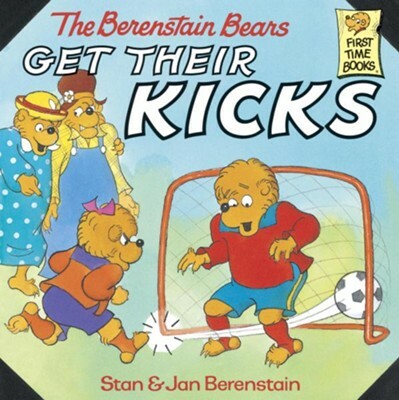 STAN and JAN BERENSTAIN were both born in 1923 in Philadelphia. They didn't know each other as children, but met later at school, at the Philadelphia College of Art. They liked each other right away, and found out that the both enjoyed the same kinds of books, plays, music and art. During World War II, Stan was a medical assistant in the Army, and Jan worked in an airplane factory. When the war was over, they got married and began to work together as artists and writers, primarily drawing cartoons for popular magazines. After having their two sons Leo and Michael, the Berenstains decided to write some funny children's books that their children and other children could read and enjoy. Their first published children's book was called The Big Honey Hunt. It was about a family of bears, who later became known as the "Berenstain Bears." Stan and Jan planned all of their books together. They both wrote the stories and created the pictures. They continued to live outside of Philadelphia in the country. There are now over 300 Berenstain Bears books. I'm the author/artist and I want to review The Berenstain Bears Get Their Kicks - eBook.